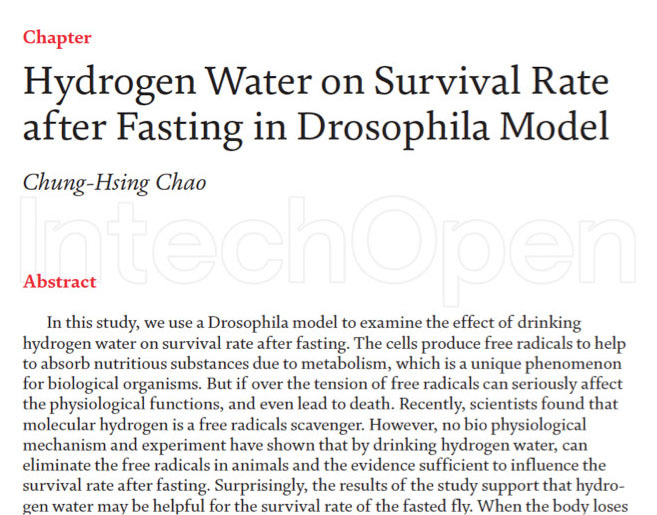 This study used the Drosophila model to study the effect of drinking hydrogen water on the survival rate of fasting flies. Free radicals are important factors for cells to absorb nutrients after metabolism, but excessive free radicals can cause damage to cells. This is a contradiction that organisms have to accept. This is like saying that people will inevitably get sick when they are alive, and that the dead will never have a state of illness. Therefore, it is because we are a life, and the existence of disease in life is an inevitable phenomenon. Many people will feel sad or feel bad about their illness. In fact, getting sick is the inevitable result of life. Only the difference between the severity of the illness and the individual is not absolutely sick or completely healthy. There are many accidents after birth, but one result is inevitable, that is, disease and death. The anti-aging research is logically not to hope for eternal life, but to prolong the healthy survival time. Therefore, we have seen that some substances and methods can resist anti-aging. We can only start from the goal of prolonging the healthy life. Do not expect too much. The effect is very remarkable. Health is a complex problem. There is a need for composite means. Life and health need support from many aspects. For example, we all know very well that genetic factors are important, nutrition factors are critical, environmental factors cannot be ignored, and psychological factors must be taken seriously. The contribution of free radicals to disease and aging is a common medium among these various factors. For example, genetic, environmental, psychological and nutritional factors can all be caused by free radicals. Anti-free radicals can be used for the above-mentioned nutrition, psychology and environment. An overall complement to the composite approach and technology. In the past many years, no ideal anti-oxidation tool has been found. Recently, hydrogen has been found to be an ideal anti-oxidation tool. Its outstanding advantages are the safety of the human body, the anti-oxidation effect is clear, and it is related to various oxidations. Diseases may also have preventive and therapeutic effects. Blue represents ordinary water, yellow represents hydrogen water, and height is the survival rate. As can be seen from the fourth day, the survival rate of fruit flies drinking hydrogen water is significantly higher than ordinary water. This is a female gene (SOD)-deficient fruit fly, and the male fruit fly is more effective, with a difference from the third day. The study found that hydrogen flies have better effects on fruit flies with antioxidant enzyme gene defects. 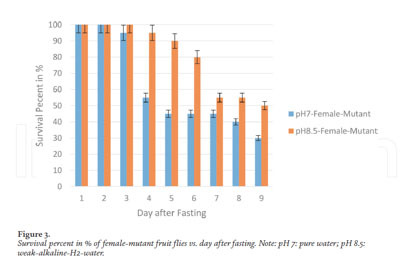 The authors believe that animals with disease states, such as genetic defects and hunger, respond better to hydrogen water, but hydrogen water has no significant effect on healthy fruit flies. Nevertheless, the authors believe that reactive oxygen species have important physiological functions under normal conditions, and hydrogen antioxidants may interfere with the normal function of reactive oxygen species. To put it simply, although healthy people do not respond to hydrogen water, it is as if healthy people do not need to take medicine. Health people do not need to drink hydrogen water. My personal opinion is that healthy people do not have to drink hydrogen water, but people who are truly healthy do not exist. People will be affected by various factors inside and outside the body after birth. Proper use of hydrogen, such as drinking hydrogen water regularly, is on the body. It is necessary to carry out certain protection. It is like saying that it is not necessary to wear too much clothes in the heat of the day, but if it is cold, it is necessary to add clothes properly, and you cannot wait until the frozen trembling to wear clothes. However, no matter whether a healthy person can drink hydrogen water or a healthy person does not drink hydrogen water, all of them are on paper. Everyone's views can't be absolutely reliable. Healthy people need it. Finally, they should rely on evidence.